This house, like the city of Lancaster, started off small and then blossomed with the growth of the textile industry. Built between 1820 and 1830, the original home was much smaller than the grand manse it is today. The house went through a series of owners until it was remodeled and expanded in the 1850s. A business called Heath, Springs & Company then purchased the property in 1888, and textile magnate Leroy Springs made the house his residence. Leroy Springs founded Lancaster Textile Mill, one of the largest textile mills in the state and possibly the country. Springs also directed several other mills in the Upstate, and the resulting economic boom led Lancaster into an era of prosperity. In 1902 Springs assumed full ownership of the house and remodeled it to its current state in 1907. This was the same year his first wife died. Later he married Lena Jones Wade, a 1924 Vice President of the United States nominee. The house remained a residence until 1957 when the town purchased it and utilized it as its city hall until 2000. Today the Springs House serves as the Lancaster County Council for the Arts. 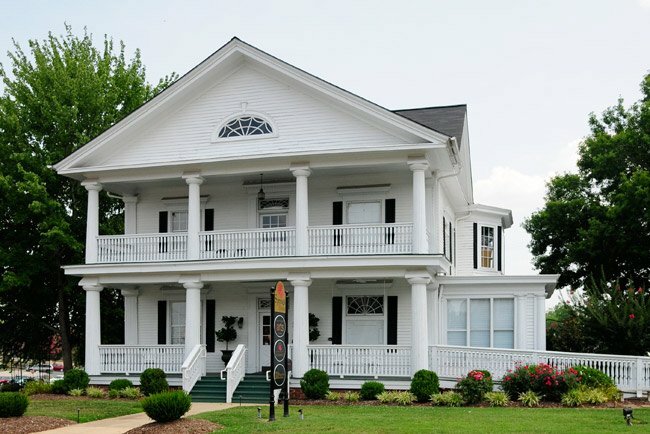 The Leroy Springs House is an impressive two-story, frame residence in downtown Lancaster that was converted to municipal use as a city hall in 1957. An original section of the building was constructed around 1820-30. The house was greatly enlarged in the mid-1850s and it took its present appearance in a ca. 1906-07 remodeling. The original owner and builder are not known. The owner during the 1850s renovations was Samuel Buckner Massey. The ca. 1906-07 remodeling, which the building’s integrity derives from, occurred under the ownership of Colonel Leroy Springs, who secured James M. McMichael, an architect from Charlotte, North Carolina, to plan the changes and additions. The façade features a two-tiered pedimented portico defined by fluted columns with Doric-influenced capitals. The pediment contains a semi-elliptical window with tracery. There is a two-story, flat roof porch addition at the rear. The main interior feature is an entrance stair in a two-story foyer. Leroy Springs played a major role in the industrial development of Lancaster and the surrounding area. The Leroy Springs House represents a significant part of Lancaster’s past, and in this single building, the development of the town is reflected. The house contains structural evidence of a plain house of the early nineteenth century as well as the early twentieth century attempt of a successful industrialist to express his wealth and power through his residence. Many people believe that the town of Lancaster owes its character and economic status largely to Leroy Springs and his vision for the southern textile industry. We are very fortunate to live in Lancaster, SC, where arts-in-education is supported through projects like this one!